ww2dbaseFranklin Delano Roosevelt met Anna Eleanor Roosevelt, his fifth cousin once removed, on a train in 1902 they subsequently began a secret correspondence which turned into a romance. Although Franklin's overbearing mother, Sara, disapproved of the match the pair were married on 17th March 1905. Unfortunately it was not to be happily ever for the Roosevelts, when she discovered Franklin's affair with a secretary. She gave an ultimatum to her husband; either end the relationship or divorce. He chose to end the relationship but the episode had inspired her to pursue her own career in public life, and not live in her husband's shadow. ww2dbaseBorn in New York City in 1884, the daughter of wealthy socialite Elliott Roosevelt, brother of US President Theodore Roosevelt, as a child Eleanor Roosevelt was tutored privately at home and then, after the death of both her parents, at Allenswood Academy, a private girls' school in Wimbledon near London. After her marriage, she would become an adept politician in her own right and a formidable figure in American politics. She encouraged Franklin when his political aspirations seemed doomed by the diagnosis of a crippling poliomyelitis illness, and remained a willing supporter of his career in peace and war; steadfastly being by his side throughout his four hard terms as president of the United States. After his election to the presidency she became well known as a writer on current topics and as a public speaker. As a journalist she became famous across America for her widely syndicated column "My Day" begun in 1935.
ww2dbaseRoosevelt was a staunch, outspoken, and sometimes controversial, supporter of civil rights, particularly for women and ethnic minorities and helped to sway many African-American voters away from the Republican Party over to the Democrat Party. 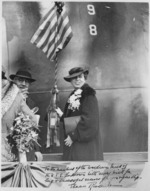 Hugely popular with the American public, in her position as the Official Director of the Office of Civilian Defense, she was warmly welcomed on her frequent wartime visits to Europe and the Pacific. ww2dbaseAfter Franklin's death in 1945, she continued to have some influence in the Democratic Party and was one of the US delegates to the United Nations Assembly in London in 1946. In December 1947 she became the first chairperson for the United Nations Commission of Human Rights. A position that she held until 1953.
ww2dbaseDuring the 1950s Roosevelt embarked on an exhausting high-profile touring schedule both at home and abroad on behalf of the United Nations and the work that she did there. As well as newspaper and magazine articles, she wrote a number of books, some on political subjects, but mostly reminiscences of her life and world-wide travels. 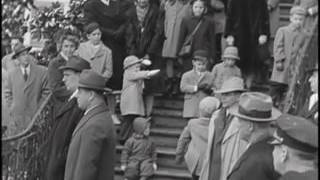 They included This Is My Story, 1937, This I Remember, 1949, and You Learn by Living, 1960.
ww2dbaseThe respected Eleanor Roosevelt passed away on 7 November 1962 at her Manhattan home after a defiant battle with a rare bone marrow disease. 11 Oct 1884 Eleanor Roosevelt was born in New York, New York, United States. 7 Dec 1892 Eleanor Roosevelt lost her mother to diphtheria. 14 Aug 1894 Eleanor Roosevelt lost her father to alcoholism. 23 Oct 1942 Mrs. Eleanor Roosevelt arrived in London, England, United Kingdom for a three-week visit as guest of King George VI. 27 Aug 1943 Eleanor Roosevelt arrived at Auckland, New Zealand on the personal invitation of New Zealand Prime Minister Peter Fraser. She took an overnight train for Wellington, New Zealand. 28 Aug 1943 Eleanor Roosevelt arrived at Wellington, New Zealand. 31 Aug 1943 Eleanor Roosevelt arrived at Rotorua, New Zealand and visited Whakarewarewa with the famous guide Rangitiria Dennan. 1 Sep 1943 Eleanor Roosevelt arrived at Auckland, New Zealand. 3 Sep 1943 Eleanor Roosevelt departed Auckland, New Zealand for Australia. 7 Nov 1962 Eleanor Roosevelt passed away in New York, New York, United States.